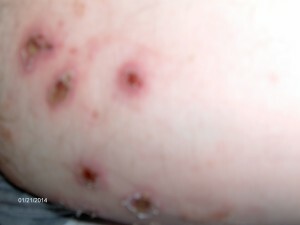 We have seen a patient who is 50 years old with the history of sores on his arms and thighs. The patient was seen by Dr. Jain who diagnosed the patient having impetigo. The patient also had deeper tissue infection and is called ecthyma in which the infection is deeper and tissue gets ulcerated. Dr. Jain ordered the culture of the lesion and CBC and blood chemistry. 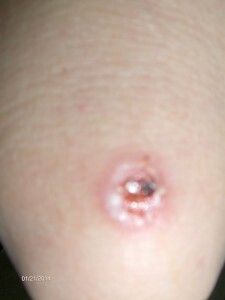 The patient was given the injection of the antibiotic followed by oral antibiotic. Impetigo is the superficial infection of the skin with honey colored scales. The patient can develop kidney problems (golmerulonephritis) if it is not treated in the children. Impetigo occurs from the bacterial infection which gets implanted in the skin by trauma and forms a blister. The organisms are usually Staphylococcus and Streptococcus. The treatment is by oral antibiotics to cover the organisms. This entry was posted in Emergencies, Emergency Care, Family Health Care, Medical Needs, Patient Stories, Pediatrics, Routine Medical Services, Urgent Care and tagged blood chemistry, CBC, culture, Dr. Jain, ecthyma, golmerulonephritis, honey colored scales, impetigo, implanted in the skin, injection of the antibiotic, kidney problems, lesion, oral antibiotic, oral antibiotics, sores on his arms and thighs, Staphylococcus, Streptococcus, superficial infection, tissue infection, ulcerated. Bookmark the permalink.